The first step to building a locator is defining what type of data you have with which to build a locator. This is done by choosing the locator role that fits your data. The locator role defines the type of data that is being used (parcel, street centerline, postal, point of interest, and so on) and provides the appropriate fields that should be used when building the locator. Once created, a locator contains a snapshot of the reference data that is used for geocoding, as well as indexes and local addressing knowledge that help return the best match during the geocoding process. When choosing a locator role on which to build your locator, several things should be considered, including the type of geometry in your reference data and the format of the data you want to geocode. The Point Address locator role is commonly used to model addresses at a single location. The POI role can be used for finding features that are identified by a name or code. The following table shows some of the basic characteristics of each of the locator roles provided with ArcGIS Pro. These roles can be used to geocode an address with some additional zone information, such as 320 Madison St., 53606 or 329 Holiday Court, La Jolla, CA 92122. Locator roles are further extended to include an alternate name table, which allows geocoding addresses based on the alternate name for the primary features. Each feature represents an address. Each feature represents an address with optional subaddress elements. Each feature represents a particular geographic place-name or landmark. Each feature is identified by a text string, name, or code (code can contain numbers but must be represented by a text string). Each feature represents sequentially numbered markers placed along roads at regular intervals. Each feature represents a particular administrative area such as city, neighborhood, metro area, territory, region, and so on. The Point Address locator role allows you to create locators for common addresses that contain a street number and street name. This locator role uses feature classes with polygon or point geometry as primary reference data. Each feature in the primary reference data corresponds to a single address. For example, you can use a feature class containing parcel polygons, building footprints, or parcel centroids (the center points of parcel polygons) as the primary reference data for a Point Address locator. Each address you want to search must be present in the primary reference data. Exact locations cannot be extrapolated or interpolated from any type of range of addresses on a street. As shown below, the Point Address locator role requires that each feature in the reference data correspond to a single address value, such as a parcel or building. To use a feature class as reference data for a Point Address locator, it must have individual fields that contain a street number and street name information and a SHAPE field, as well as an optional address JoinID field that can be used to link to an alternate name table. In addition, you can specify fields that contain the street's prefix direction, prefix type, street type, suffix direction, postal, postal extension (such as ZIP+4 for the USA) or zone (administrative area such as city, neighborhood, and so on) . The Point Address locator role includes support for addresses that contain subaddress information such as identifiers for apartment units, townhouses, duplexes, or stores in a shopping plaza. Subaddresses can be found in a wide variety of residential and commercial buildings, as well as special structures and establishments such as airports, trailer parks, piers and docks, and school campuses. Each feature in the point or polygon primary reference data corresponds to a single address with subaddress information. You can use a feature class containing building footprints or address points as reference data. Each address you want to search must exist in the reference data. Exact locations cannot be extrapolated or interpolated from any type of range of addresses on a street. As shown below, Subaddress requires that each feature in the reference data correspond to a single address value, such as buildings or address points. In addition to the basic address attributes, the feature class as primary reference data for a Point Address locator that supports Subaddress may contain individual fields for building type, building name, level type, level name, unit type, and unit number. When searching for addresses that contain subaddress information, a subaddress indicator (#, Apt, Suite, Bldg, Floor) must precede the subaddress number, otherwise the address gets matched to the record in the data that returns the highest score. If the address data contains building, level, and unit information for a subaddress record, only one of the subaddress elements is used for matching to one of those elements in the search string. The Street Address locator role allows you to create locators for common addresses with house numbers, street intersections, and only street name. One advantage of this locator role is that it permits you to provide a range of house number values for both sides of a street segment. With this, the locator can not only deliver a location along the street segment but can also determine the side of the street segment where the address is located. This locator role uses feature classes with line geometry. Each feature in the primary reference data represents a street segment with two ranges of addresses that fall along that street segment, one for each side of the street. 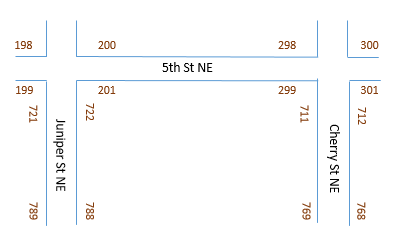 To use a feature class as primary reference data for the Street Address locator role, it must have four fields that contain From address and To address information for each side of the street, as well as street name information, a SHAPE field, and an optional JoinID field that contains an ID that can be used to link to an alternate name table that should be in the reference data. In addition, you can specify fields that contain the street's prefix direction, prefix type, street type, suffix direction, or zone. This locator role supports normal block ranges, alphanumeric addresses with grid zone, or hyphenated addresses containing cross street information in the house number. Street intersections are also supported by this locator role. Optional fields such as ZIPL and ZIPR (Postal for each side of the street), left and right city, and state or province abbreviation fields in the reference feature class can be used. Tables of addresses that can be geocoded against the locators created with this locator role must have an address field containing the street number and street name in addition to the street's prefix direction, prefix type, street type, or suffix direction, if any. Intersection descriptions (for example, Eureka Blvd. & Vine St.) can also be included in this field. Searching for street names is also an option with a locator created with the Street Address role, and the address field in a table of addresses must contain the street name in addition to the street's prefix direction, prefix type, street type, or suffix direction, if any. The POI (Points of Interest) locator role allows you to create locators for data that contains names of landmarks, places, or buildings. The role also allows you to create locators for address data that contains alphanumeric strings for identifying locations, such as N1N115. You can use locators created with this role to find features such as mountains, bridges, rivers, cities, and so on. Locators created with this role can also be used to find cellular towers, census tracts, and virtually any unique feature represented in a feature class. This locator role also allows you to assign categories and subcategories to each feature that can be used to limit results when geocoding, or just for additional information about the feature once it is geocoded. This locator role uses feature classes with point or polygon geometry as primary reference data. In addition to a feature ID field and SHAPE field, feature classes that you can use as reference data for the locator must have attributes representing the names and geographical zones, such as city, state, and country, to distinguish the location of the feature, or a specific field that contains the unique name or value for that feature. Optionally, a join field that contains an ID that can be used to link to an alternate name table should be in the reference data. To use categories and subcategories, the primary reference data should contain 1-2 fields that categorizes the features. Using polygon geometry for the primary reference data will return optimal reverse geocoding results. If you have features that represent different types of places or locations in multiple feature classes, such as bus stops, metro stops, parks, and schools, it is recommended that you merge each of the feature classes into a single feature class since only one primary reference dataset can be used per role. Tables of addresses that can be geocoded using this locator role must also contain the place-names and geographical zones or unique name or value that can be used to identify the locations. The geographical zone information is used to narrow down the search since it is common that the same name, such as Rochester, can be found in multiple states in the country. The Distance Marker locator role allows you to create locators for distance markers (sequentially numbered markers placed along roads at regular intervals). This locator role uses feature classes with point geometry, and each feature in the reference data represents a distance marker or sign. To use a feature class as reference data for a Distance Marker locator, it must have fields that contain distance value, distance direction, a unit of measure, and street name information; a feature ID field; and a SHAPE field. The Distance Range locator role allows you to create a locator for street segments with distance marker ranges. 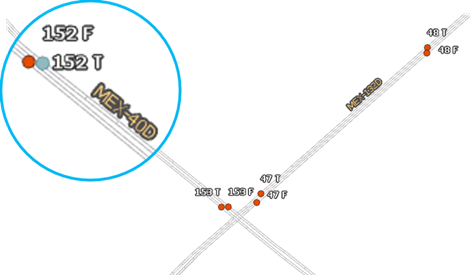 This locator role uses feature classes with line geometry, and each feature in the reference data represents a street segment with one range of distance markers that fall along that street segment. To use a feature class as reference data for a Distance Range locator, it must have fields that contain distance from, distance to, and street name information; a feature ID field; and a SHAPE field. The Postal locator role allows you to create a locator for postal codes. This locator role uses feature classes with point or polygon geometry, and each feature in the reference data represents a postal polygon or its centroid. Reference data for a Postal role locator must have a field that specifies the postal code for the feature, a SHAPE field, and optionally a join field that contains an ID that can be used to link to an alternate name table . Tables of addresses that can be geocoded using this locator role must contain a field that has the postal code information. The Postal Extension locator role is for geocoding postal codes with extensions, such as United States ZIP+4 Codes. This locator role can be used to create locators that use point feature classes as primary reference data. 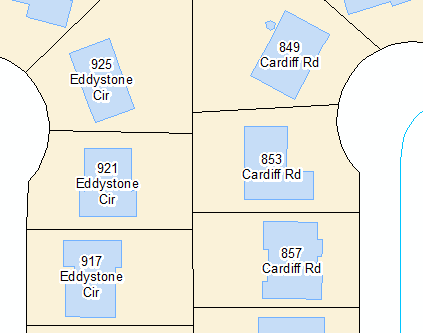 Each feature in the primary reference data source represents a postal code extension point. 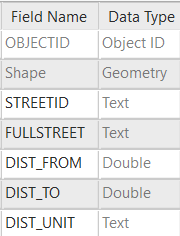 In addition to ObjectID and Shape fields, the reference data feature class or shapefile must have a text field that represents the postal code ( in the United States, the five-digit ZIP Code) of the feature and another text field that contains the postal extension code (in the United States, the four-digit ZIP+4 Code). 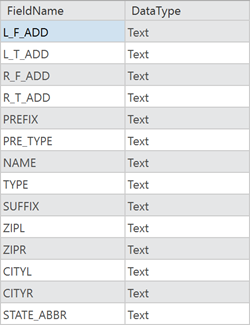 To geocode a table of addresses using a Postal Extension locator, the table must have a text field that contains the entire postal code plus the postal extension code. For example, in the United States, this would be the ZIP+4 Code (the five-digit ZIP Code as well as the ZIP+4 code), as in 12345-6789, 12345 6789, or 123456789. The Postal Locality locator role allows you to create a locator for postal localities. This locator role uses feature classes with point geometry and each feature in the reference data represents a postal region. Reference data for a Postal Locality role locator must have a field that specifies the postal code and city for the feature, a SHAPE field, and optionally a join field that contains an ID that can be used to link to an alternate name table . The Administrative area roles are for geocoding areas such as cities, neighborhoods, counties, provinces, districts, territories, and states. This role can be used to create locators that use point or polygon feature classes as primary reference data. When you build a locator with multiple roles that includes both address level and administrative areas, the administrative area polygons will be used to populate missing administrative zone attributes from address data. As you look over the list of locator roles when you create a locator, you'll notice that there are other attributes to distinguish the various locator roles. You can use a table to define alternate names for the features in your reference data feature class. 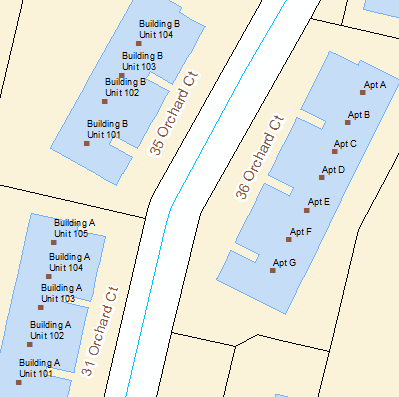 Using alternate street names allows you to match an address to a feature using one of many names for the feature. For example, if Bridge Street is also known as Slash Road, you can find the same address using 266 Bridge Street as you can using 266 Slash Road. Each role contains administrative zone fields, such as City, State, and Postal, that should be used wherever possible to further increase the likelihood of a correct match. There may be a long street that crosses multiple zones, such as Lake Shore Drive in Chicago, IL, USA, which spans the city and crosses through more than five postal codes. Given the previous example, if only a street address without the postal code is geocoded, you will get multiple matches without the ability to determine which one is correct. Each feature in the reference data can be specified with an extent that can be used to display the match location. It requires four fields in the table to store the minimum and maximum x-coordinates and the minimum and maximum y-coordinates: Xmin, Xmax, Ymin, and Ymax. The values in the fields must be in the same spatial reference of the feature's geometry. The Xmin, Xmax, Ymin, and Ymax values are combined to set the map extent for displaying a geocode result. If these four fields are not set for building the address locator, the geocode result will be displayed based on a default zoom factor defined by the application. Each feature in the reference data can be specified with a pair of x,y values that represent the actual or preferred location of the address (in other words, the building or parcel centroid). It differs from the x,y values of the match result, which are derived from a location along the street or the street entry for an address. The values in these fields must be in the same spatial reference of the feature's geometry. The Display X and Display Y fields can be used by some applications for more precise mapping of the features and accurate locational analysis. Each locator role allows for additional custom output fields to be added to the locator. These fields are optional. You can choose any field or fields from the reference feature class to be included as a custom output field or fields. When you search for an address using a locator that has a specified additional field, the information from the corresponding field in the reference data is displayed in the address candidates and saved in the output feature class. Common examples include Block ID, special identifiers, or names of property owners. The additional fields saved in the output feature class can be used to join to other attribute tables or feature classes for further spatial analysis. The information can also be useful when you rematch the addresses and need additional information to determine a correct match.